I made this soup a while back and uploaded the photos, intending to come back later and add witty commentary. Except that I no longer remember what was going on the day I made the soup. Not sure why I even tried this particular recipe, having posted a rather nice and easy version a while back. About the only thing I can remember is that I used chicken broth as the base. But you can easily make a parve/veggie/vegan version by using veggie broth instead. Part II in my inadvertent series: Kinda-Sorta. Dan Dan is a Chinese dish of minced or ground meat in a very spicy sauce, served over noodles. Dan Dan noodles are nice and thick. Udon, thick chinese noodles, are traditionally used. Thick spaghetti or linguine can be substituted. I didn't have either. Thought I did. But I didn't. Only gots thin spaghetti. Still tasted good, but not the same mouthfeel. 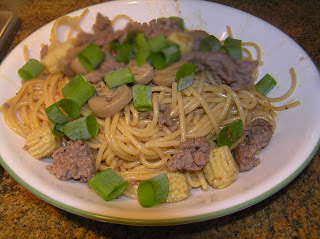 The Dan Dan recipe I based this recipe on contained bamboo shoots. Since I'm the only one who eats bamboo shoots, dumping in a can would be wasteful. No problem, water chestnuts, though not authentic, are family-friendly and have a crunch. I was introduced to this recipe by one of my Dear Readers. She explained that this soup is so good, even bean-haters will like it. She has never met youngerSon. Oh, well, theHubby and I thought it was delish. The part of panchetta will be played this evening by Bacos®. The directions call for pureeing the soup before serving, but there's no law that requires you to do it. If you like, skip the immersion blender business and serve the beans intact. This is America! Bean Freedom! I used chicken broth because the soup was served at a meat-based meal, but you can easily substitute veggie broth to create a parve/vegan version (and as long as you are substituting, optionally toss in a little parmesan cheese for dairy). It's difficult, but not impossible to find actual kosher chinese recipes on the intertubes. Difficult due to the fact that even many beef recipes use some items that are potential no-no's -- such as fish sauce, which uses at least one non-kosher fish (if there are any kosher brands out there I would love to hear about it). Sure, I could use a little mashed anchovies or the juice squeezed from a can of tuna, but then I'd have to be more efficient and either freeze the remaining anchovies (then lose it in the black hole we lovingly call the freezer) or else remember to save the oil/broth from when I make a tuna dish then freeze and lose it anyway in the black hole freezer.